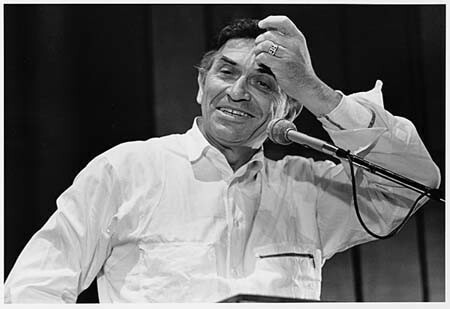 To see a show put on by Bill Graham at San Francisco's Fillmore Auditorium in the late 1960s was to see a new kind of concert experience. It started with the musicians. Graham cultivated many of the rock and roll acts that created a new kind of music, and provided the soundtrack for the counterculture revolution. 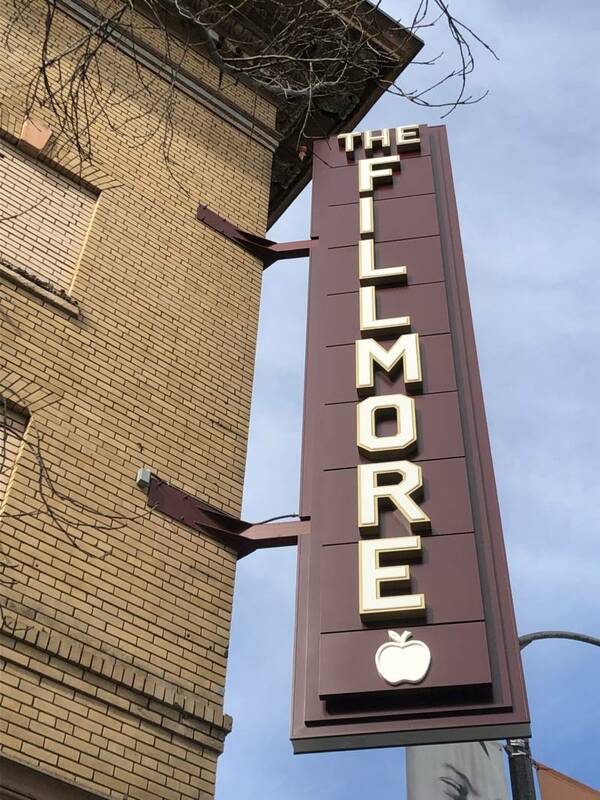 Acts like the Grateful Dead, Janis Joplin, Jimi Hendrix and Santana were regulars at the Fillmore. "He used to book very unusual opening acts," said Bonnie Simmons, executive director of the Bill Graham Memorial Foundation. "You might be coming to see the Jefferson Airplane, but the opening act would be Andrei Voznesensky, the Russian poet." But maybe the oddest aspect of Graham's Fillmore shows had nothing to do with the performances at all. At every show, concertgoers were greeted by a barrel of Red Delicious apples, free for the taking. Simmons remembers seeing the apples when she went to concerts at the Fillmore in the 1960s. When the venue in the city's Western Addition reopened under new management in the mid-1990s, the apple tradition continued. 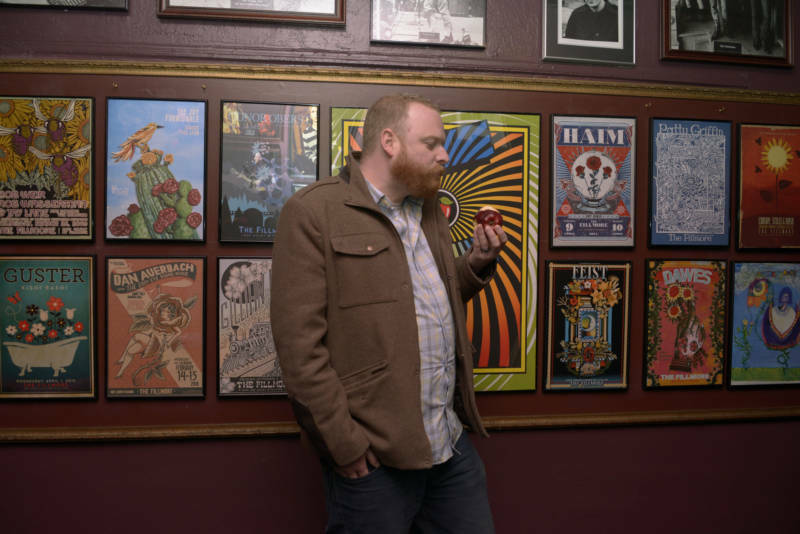 "Of all the shows that I've been to and all the different venues, it’s the only place that hands out fruit," said Sandra Julien, who's been going to shows at the Fillmore since she moved to the Bay Area eight years ago. 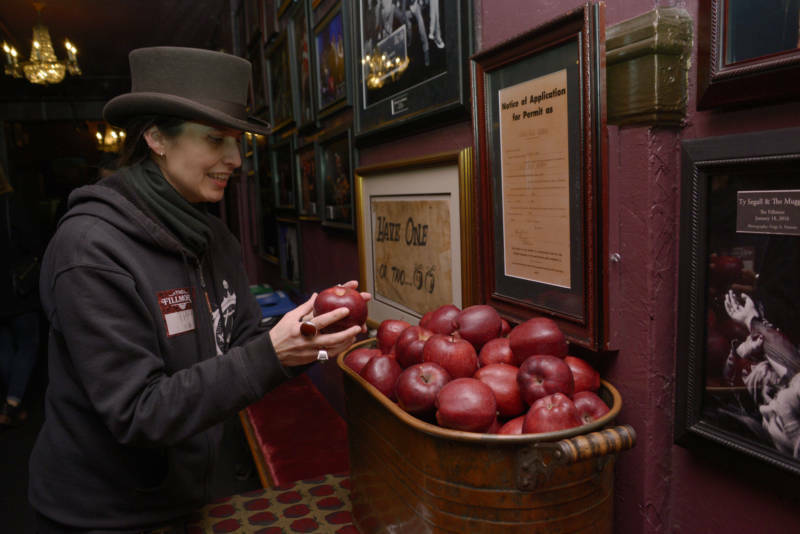 Julien wanted to know more, and asked Bay Curious: Why does the Fillmore hand out free apples? Graham, who was killed in a helicopter crash in 1991, never explained his reasoning behind the apples, leaving others to guess at his motivation. Some say that he wanted to give the broke hippies who came to his shows something nutritious to eat. Many believe that it was an extension of his famous hospitality, which he learned working as a waiter in the Catskills. "To my mind the barrel of apples was Bill’s attempt to welcome people to his house," said Bob Greenfield, who co-wrote Graham's autobiography. But about a decade ago, Bonnie Simmons stumbled on another possible explanation that dates back to Graham's experience fleeing Nazi Germany as a child. Graham was born Wolfgang Grajonca to a Jewish family in Berlin in 1931. After Nazis brutally attacked Jewish synagogues, homes and businesses in a 1938 event that came to be known as Kristallnacht, or the Night of Broken Glass, Graham's single mother put him and one of his sisters in a German orphanage to protect them from the government. The following year, they were sent to an orphanage in France. It was the beginning of an arduous journey through Europe and Africa that would kill his sister and eventually ended with young Graham in 1939 getting on a boat bound for the United States, where he was adopted by a family in New York. Also on that journey was a boy named Ralph Moratz, who became friends with Graham when they met at the German orphanage. "We became best friends sharing, for the next few years, the hardships imposed by the German invasion of its surrounding countries," Moratz wrote in his chronicles of their friendship and journey. One of the kids' early stops was a chateau in Quincy-sous-Sénart in northern France. The neighborhood was filled with German soldiers, and the kids were stuck inside with little to eat. "For breakfast we got a cup of watery porridge and a thin stale slice of bread. No lunch. Dinner consisted of half a cup of rice from the one bag still stored in the cellar," Moratz wrote. "We spent most of our time trying to sleep. Only with sleep could we get some relief from the constant hunger pangs." According to Moratz, a few of the older boys decided to organize the kids into groups to sneak out and forage for apples from the many orchards in town. Groups of four boys would be lowered out a window in the chateau 6 feet down to the ground. They carried empty rice bags, which could fit 15 to 20 apples. Younger boys, like Moratz and Graham, were sent out most often, under the assumption that they would attract less attention from German patrols. The older boys liked to vary who went out to try to avoid detection, but Moratz said Graham found a way to be a part of the raiding party more often than not. "Would it surprise you to find out that Wolfgang [Graham] volunteered to go out and forage every day?" Moratz wrote. Graham never spoke publicly about this experience, and he rarely talked about his time during the Holocaust at all, telling people that he remembered very little of his life before making it to the United States. But that hasn't stopped people from latching onto Moratz's story. "Many of us now believe [giving away apples] was some kind of hidden impulse to share the life preserving fruit, which saved us from certain starvation, with the public as a form of thanksgiving," Moratz wrote. Bob Greenfield, Graham's biographer, is not convinced. “He’s making a link that I don’t think Bill ever made even unconsciously," he said of Moratz, who died in 2016. "Bill always lived in the moment. He wasn’t someone who was possessed by or living in the past." 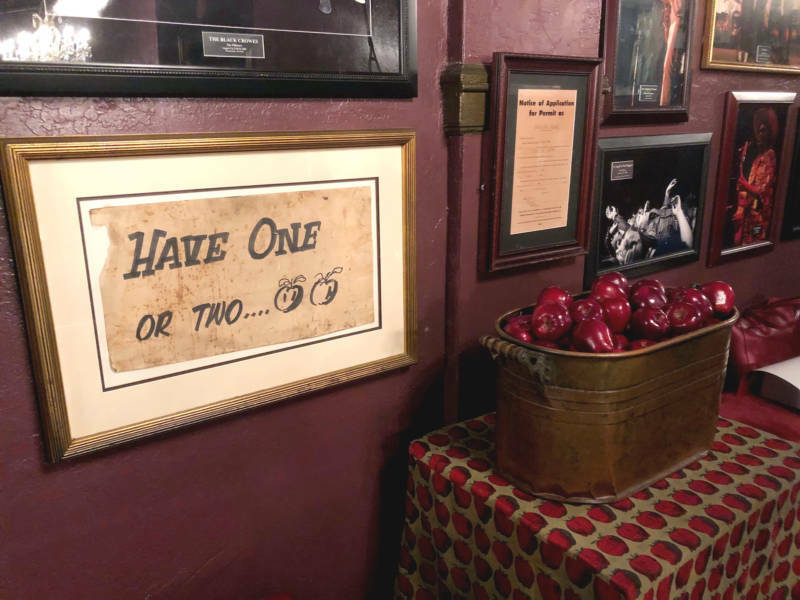 With Graham gone, we will never know for sure why the apples became a Fillmore staple. But question asker Sandra Julien said hearing about Graham's escape from Europe makes the Fillmore even more meaningful to her. "Now when I go to the Fillmore, I’m always going to think of this," she said.